Toothpastes are important for overall oral hygiene, keeping your teeth and gums generally healthy and preventing tooth decay. Toothpastes can also be very important to guard from discolouration when using the correct products. Most toothpastes found in British Supermarkets do not use the same formulations as the products offered from Teeth Whitening Shop. The toothpastes in the chart below give far greater protection from discolouration and give a stronger whiten when used daily. Toothpastes with teeth whitening properties will gradually whiten your teeth through daily use and will often compliment the use of teeth whitening kits. 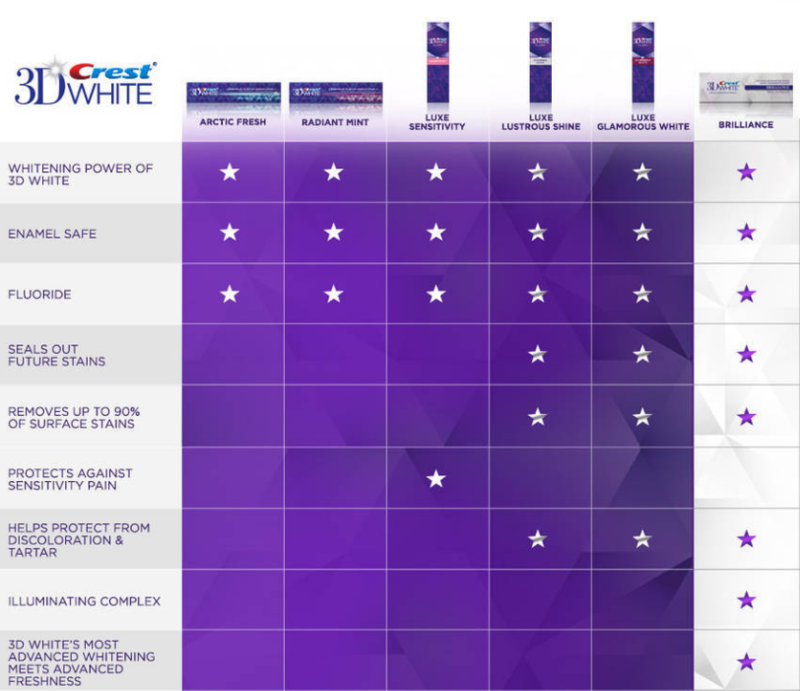 The toothpastes shown in the graph below are all produced by Crest the world leading dental whitening brand and are designed to compliment the use of Crest Whitestrips. Please use the graph below to help you decide which toothpaste to purchase. For any further questions contact us anytime on Live chat, phone or email.